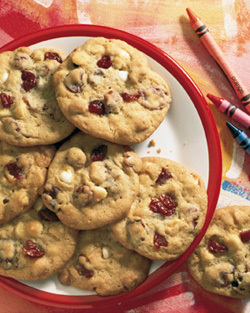 Addictively good cherry chocolate chip cookies. We thank George Washington for the inspiration. Our tip of the day today is a tasty tip indeed: Make a cherry version of your favorite chocolate chip cookies to celebrate George Washington’s birthday. The Father of our Country was born February 22, 1732. Look for cherry baking chips in baking supply stores or online. Then, make your favorite chocolate chip cookie recipe, dividing the chip quantity between chocolate chips (or white chocolate chips) and cherry chips. Another variation on the theme is to add an extra half cup of dried cherries to your recipe (with or without the cherry chips). You also can sprinkle the cherry chips on cupcakes, use them to decorate cakes and puddings, garnish ice cream and add them to muffin and pancake batter. Use this recipe to make the cookies. Try the delicious Cherry Chocolate Chip Ice Cream from Graeter’s. If you can’t find it locally, they’ll ship it to you.